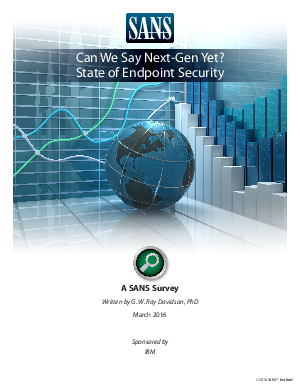 The perimeter continues to dissolve, and the definition of endpoint is evolving, according to results of the SANS 2016 Endpoint Security Survey, now in its third year. As we might expect, 90% or more consider desktops, servers, routers, firewalls and printers to be endpoints that need to be protected. After that, respondents include other less-typical devices in their definition of endpoints that warrant protection: 71% include building security (access/ surveillance), 59% include employee-owned mobile devices and 40% consider industrial control systems as endpoints that need to be protected. Some respondents also consider POS devices, smart cars, emulated endpoints in the cloud and wearables as endpoints needing protection, highlighting the diversity of thinking among respondents.